﻿Main > North > Chiang Mai > Wiang Haeng > Muang Haeng > The Little House In The Big Forest Doicome Project.. The Little house in the big forest Doicome Projects. Located in the city of Wiang Haeng district . 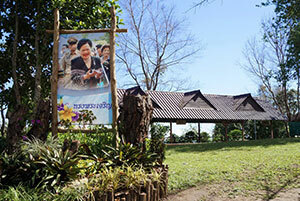 The area is Huai Nam Dang National Park covers an area of 161,850 acres Queen Sirikit visited the mountain area and she want to prepare a project . The Little House In The Big Forest Doicome Projects, The basis of the third district, is Full ,warm and ideological this project has local people border guards . And drug problems in the area. And learning styles or approaches people living harmoniously with the forest without destroying the forest. There are get the initiative to promote the planting of fruit trees behind the house. By Agricultural Extension Center at Chiang Mai. Promote the planting of fruit trees that can be grown under the shade of the forest, such as coffee, tea, complementing promote planting vegetables . To bring cooking . Demonstration plant vegetables to feed the community. For more information , visit . Agricultural Extension Center at Chiang Mai. Department of Agriculture , Tel. 0 5321 6203 Fax: 0 5321 6820.